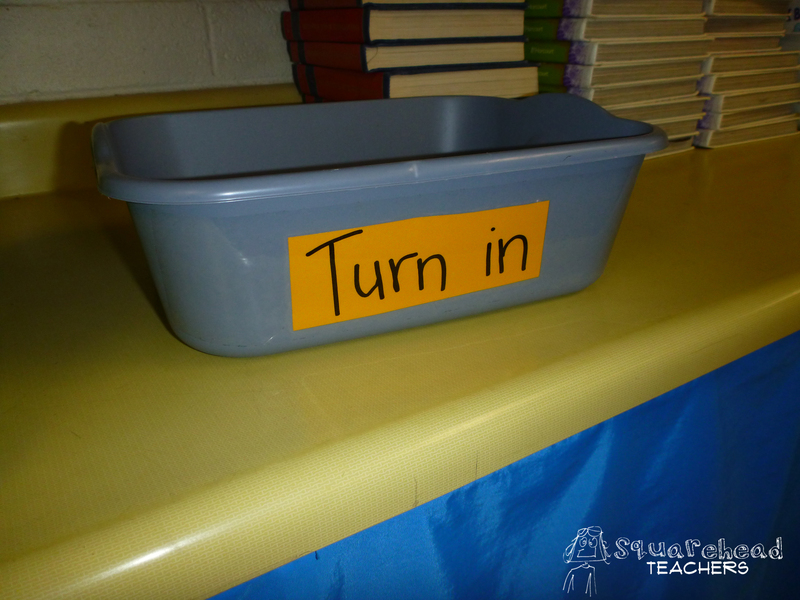 The Secret Way to De-clutter your Classroom! (I wrote about this idea a while ago, but I’ve made some signs to help you execute it, so here’s the idea again…) This idea is PURE GENIUS! I learned this trick from my mentor teacher during student teaching (way back in the day). Designate a tote or box for a super secret purpose: a secret recycle bin! Students don’t work as hard when they know their teacher isn’t going to look at their paper. So use this bin to collect papers you don’t need to look at, but still want kids to work hard on. At the end of the day when all the students are gone, you can recycle the paperwork and keep your students’ desks clutter free! The picture above is from a lower grade classroom that doesn’t have any real turn in bins. I suggested this idea to the teacher and she said it works so well, she’s gotten other teachers at her school to do this trick! She just calls the secret bin the “turn in bin.” But if you have a real turn in bin (for work you actually want to look at, grade, etc. ), consider naming this bin the “big turn in bin” or something else to distinguish it from your other trays/bins. I’ve made some signs (1/3 sheet size) for you to print off and label your tote with if you’d like. Your choice of chevron or polka dots. This entry was posted in Classroom & Decor, Management, Organization and tagged Children, classroom, Education, Elementary School, Kids, Teacher Resources, Teachers, Teaching by Squarehead Teachers. Bookmark the permalink. Great idea! I like the concept of a “secret recycle bin” So sneaky!